This page provides an introduction to estimating Shannon information from RGB coloured images and how these estimates may be used in practice. The colors in an image of a scene provide information about its reflecting surfaces under the prevailing illumination. But how should this information be quantified? How does it vary from scene to scene? And how does it depend on the spectral sensitivities of the camera or eye used to view the scene? The aim of this tutorial is to show how these questions can be addressed with the aid of some basic ideas from information theory and the computational routines downloadable from this site. You will need this package, which contains MatLab MEX files for Windows MatLab 32 bit, Windows MatLab 64 bit, and Mac OSX operating systems. This material is base on the following publication: Marín-Franch, I. and Foster, D. H. (2013). Estimating Information from Image Colors: An Application to Digital Cameras and Natural Scenes. IEEE Transactions on Pattern Analysis and Machine Intelligence, 35(1), 78-91. Suppose that a camera or the eye produces a triplet of values r, g, b at each point of the image, as in Fig. 1. Figure 1. 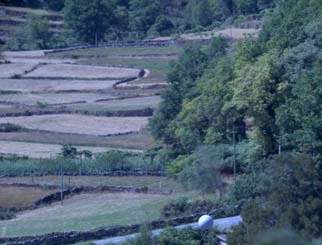 Fields scene. The pixel at the top right has colour values r, g, b. If the location of the point is unpredictable, then taken together, the triplet (r, g, b) can be treated as a trivariate continuous random variable, A say, with probability density function (pdf), f say. 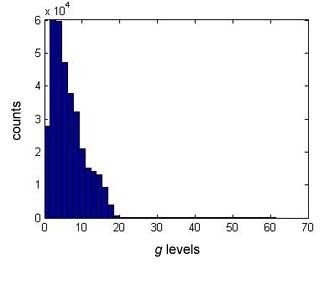 Histogram representations of the r, g, b signal levels (for the eye, long-, medium-, short-wavelength cone signal levels) are shown in Fig. 2. Figure 2. 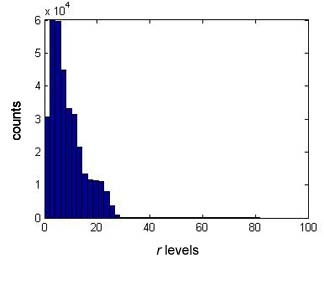 Histograms of estimated r, g, b signal levels from Fig. 1 for the human eye. h(A) = − ∫ f(a) log f(a) da. The entropy is measured in bits if the logarithm in Eqn (1) is to the base 2.
where h(A1,A2) is the differential entropy of the variables A1 and A2. Unlike differential entropy, mutual information does not depend on the units used to quantify the r, g, b signal levels. As explained in the next section, mutual information is intimately related to the number of identifiable points in a scene. These estimates do not include any uncertainty in the camera or eye due to noise, whose differential entropy may also be included in the calculation . Different cameras with different sensors will produce different histograms from those illustrated in Fig. 2. Examples are given in . Notice that these calculations are based solely on spectral information. They make no use of information about spatial position. Mutual information depends directly or indirectly on probability density functions. 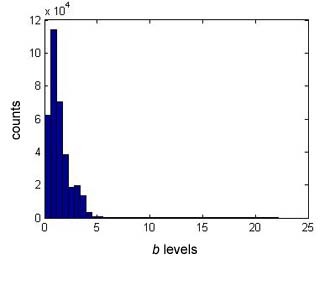 Unfortunately, using histograms such as those in Fig. 2 to estimate pdfs is difficult and can lead to marked biases . Instead, it is possible to use nearest-neighbour statistics to estimate entropies directly from the data, and then apply Eqn (2) to estimate mutual information. The Kozachenko-Leonenko kth-nearest-neighbour estimator  is used here. Its convergence properties were improved with an offset device, details of which are given in . As an example, the images in Fig. 3 are of the scene shown in Fig. 1 under the setting sun and north skylight. Figure 3. Images of the scene shown in Fig. 1 under the setting sun (left) and north skylight (right), correlated colour temperatures of 4000 K and 25000 K, respectively. For the human eye, the offset Kozachenko-Leonenko estimator of the mutual information between these two images is 17.0 bits and the number of identifiable points is 1.3x105. The following sections describe how to make these kinds of estimates with the routines available in a package downloadable from this site here. The package contains MatLab MEX files for Windows MatLab 32 bit, Windows MatLab 64 bit, and Mac OSX operating systems, and it can be downloaded here. With the MatLab MEX files, both differential entropy and mutual information can be calculated. The C++ source code used to generate the MEX files is also included in the package. The C++ code for the MatLab MEX files was implemented by Martin Sanz (martin.sanz@uv.es). If you use this software in published research, please give the reference of the source work in full, namely Marín-Franch, I. and Foster, D. H. (2013). Estimating Information from Image Colors: An Application to Digital Cameras and Natural Scenes. IEEE Transactions on Pattern Analysis and Machine Intelligence, 35(1), 78-91. A small test hyperspectral image is included in the package. If you want to experiment with other, larger, hyperspectral images, then sets of reflectance files are available here and here and separate, larger sets of radiance files are available here and here. With some hyperspectral images, the edges may need trimming to remove pixels with zero or padded values that were introduced during postprocessing. To estimate the mutual information between the distributions of colours in two images, proceed as follows. Load the subsampled scene ref4_scene5.mat and find the dimensions of the loaded array reflectances. The number of rows nrow should be 255, the number of columns ncol 335, and the number of wavelengths nwav 33. Next obtain the radiances of the reflected image of the scene under a daylight illuminant of color-correlated temperature 25000 K and then one of 4000 K (a for-loop is less efficient than MATLAB's bsxfun function, but it makes little difference here). To obtain the RGB sensor responses of a camera, choose one of the following sensor sets: agilent, foveonx3, kodak, nikond1, and sony. To estimate the mutual information apply the Kozachenko-Leonenko estimator 'kl' and, for comparison, the offset version of the estimator 'klo' to the arrays rgb_25000 and rgb_4000. The Kozachenko-Leonenko estimator gives a value of 13.9 bits whereas the offset estimator gives a value of 17.2 bits. The Kozachenko-Leonenko estimator gives a value of 13.0 bits and the offset estimator gives a value of 16.9 bits. The value of 16.9 bits for the offset estimator is only slightly smaller than the 17.0 bits reported in Section 2, which was derived from an image with higher spatial resolution (downloadable as a zip file here). The estimates are 4.2 bits, 3.1 bits, and -9.6 bits, respectively. When combined according to Eqn (2), they give the estimate of 16.9 bits for the mutual information, as in Section 4. This tutorial uses hyperspectral reflectance images so that accurate changes in illuminant spectra can be calculated. Reference  provides a general introduction to hyperspectral imaging and some of its uses in human color vision research. Several example applications are presented. These include calculating the color properties of scenes, such as gamut volume and metamerism, and analyzing the utility of color in observer tasks, such as identifying surfaces under illuminant changes. These analyses draw on calculations of differential entropy and mutual information similar to those illustrated here. T. Cover, T. M., & Thomas, J. A. (2006). Elements of Information Theory (2nd ed.). Hoboken, New Jersey: John Wiley & Sons, Inc.
Marín-Franch, I. and Foster, D. H. (2010). Number of perceptually distinct surface colors in natural scenes. Journal of Vision, 10(9):9(9). Steuer, R., Kurths, J., Daub, C. O., Weise, J., and Selbig, J. (2002). The mutual information: Detecting and evaluating dependencies between variables. Bioinformatics, 18, S231-S240. Kozachenko, L. F. and Leonenko, N. N. (1987). Sample estimate of the entropy of a random vector. Problems of Information Transmission (Tr. Problemy Peredachi Informatsii. Vol. 23, No.2, pp. 9-16, 1987), 23(2), 95-101. Marín-Franch, I. and Foster, D. H. (2013). Estimating Information from Image Colors: An Application to Digital Cameras and Natural Scenes. IEEE Transactions on Pattern Analysis and Machine Intelligence, 35(1), 78-91.